The global UIPM Sports community is celebrating after its fastest-growing development sport, Laser Run, was confirmed on the programme for the World Urban Games Budapest 2019. Laser Run, which has enjoyed a rapid growth in popularity and profile since its introduction in 2015, will be one of two showcase sports at the inaugural Games in September 2019 after its impact on the worldwide urban sports scene was recognised by the organisers, GAISF. In 2019 the UIPM Laser Run World Championships will be incorporated for the first time into the Pentathlon World Championships, taking place in Budapest from September 2-9. The following week (September 13-15), Laser Run will be revealed to new audiences around the world during the first instalment of the world’s newest multi-sport Games. UIPM President Dr Klaus Schormann said: “Laser Run is our most popular development sport and it is being discovered by new communities all the time thanks to initiatives like the UIPM Global Laser Run City Tour (GLRCT). “It is a tribute to the quality of our development programme that our newest UIPM Sport has been chosen as one of only eight to feature in this historic World Urban Games. I am happy that GAISF has acknowledged the potential of Laser Run as an urban sport for everyone. A qualifying system for Laser Run at the World Urban Games will be announced in due course, along with details of athlete quotas (per country and gender), competition format and schedule. Laser Run was introduced as a standalone sport in 2015, when the first UIPM World Championships took place in Perpignan (FRA). A year later it was confirmed by UIPM Congress as the official terminology for the combined running and shooting event that forms the climax of the Modern Pentathlon. 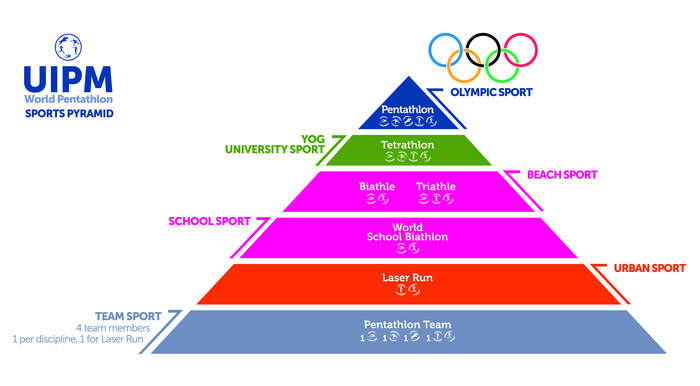 Bolstered by the expansion of the GLRCT since 2017, Laser Run has become a strong pillar at the base of the UIPM Sports Pyramid (see below). Viacheslav Malishev, UIPM Executive Board Member for Development, said: “The aim of our development programme is to give more people an entry point to UIPM Sports and enable them to find a pathway to our core Olympic sport of Modern Pentathlon. GAISF announced earlier this week that Laser Run would be a showcase sport for the World Urban Games Budapest 2019 alongside indoor rowing, and that the six competition sports would be 3x3 basketball, BMX freestyle park, breaking, freestyle flying disc, parkour and freestyle roller skate. GAISF leader Raffaele Chiulli said: “The World Urban Games programme for Budapest 2019 presents a global stage for emerging disciplines, as well as an opportunity for world-class athletes to demonstrate their abilities and for people in urban areas to take a proactive role in sport. I have no doubt that the Hungarian capital will be the perfect arena. President Dr Schormann added: “In this moment of celebration it is important that we pause to remember the late GAISF President, Patrick Baumann, who drove the creation of the World Urban Games until his untimely passing in 2018.